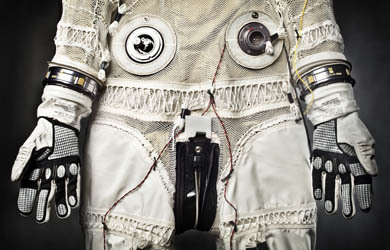 The suit to be worn by Felix Baumgartner during his skydive (Credits: Red Bull Stratos). NDX-1 being deployed during geological sampling tests at MDRS (Credits: UNDHSL). This week the University of North Dakota Human Spaceflight Laboratory (HSL) is testing out its NDX-1 Mars suit at the Mar analog site Mars Desert Research Station (MDRS) in Utah. The suit was specifically designed to meet the needs of Mars as opposed to extravehicular excursions in space. It is designed to address the gravity, thermal conditions, and dust environment of Mars. The project is supported by collaboration with NASA Ames Research Center. The NDX-1 was constructed as a concept prototype and has been tested at several Martian analog sites including the Badlands Region in North Dakota, the Marambio base in Antarctica, and the Pilbara region in Australia, and now the Mars Desert Research Station (MDRS) in Utah. 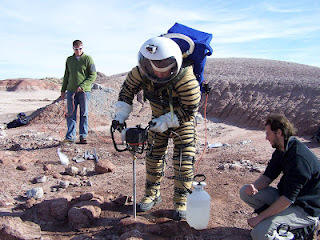 The testing being performed at MDRS is assessing the ease with which wearers of the suit can collect geological samples without undue discomfort and without contaminating the samples. HSL has developed a second model, the NDX-2, targeted for use on the Lunar surface. The video below describes Baumgartner’s upcoming dive.